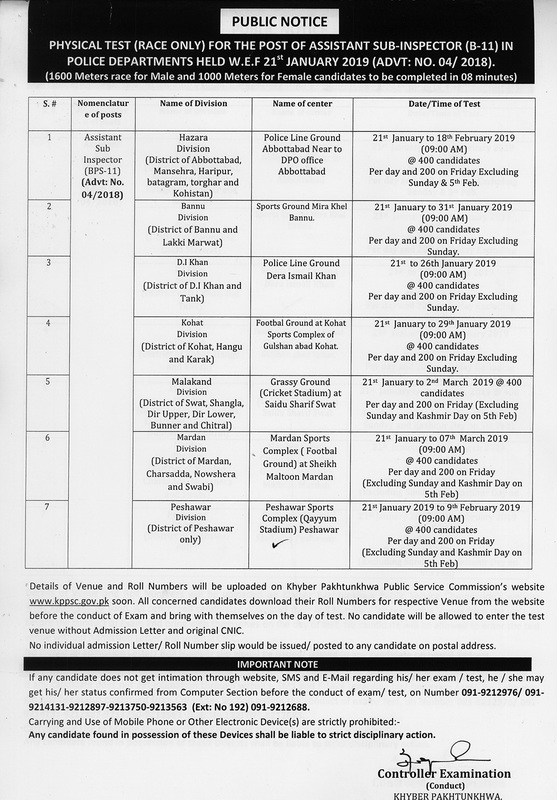 Government of Khyber Pakhtunkhwa has announced the Assistant Sub Inspector ASI Jobs 2019 in Police Department through Khyber Pakhtunkhwa Public Service Commission. There are 420 vacant posts being offered in all over the KPK province. KPPSC received the application and held the eligible candidates test 2019. KPPSC recruit eligible candidates for the right job. Now the Khyber Pakhtunkhwa Public Service commission has announced the final selected and rejected candidate list. Also KPPSC has announced the Physical Test Date 2019 for Assistant Sub Inspector. KPPSC had declared the test result of ASI Jobs 2019 for Police Department. Applicants who successfully clear the test they are waiting for the Interview schedule and selected candidates list. In this page we provide selected candidates and short listed list will be displayed and merit list will be declared here as well. KPPSC also announced the schedule of ASI Jobs 2019 Physical Test. At this page we provide online interview schedule and selected candidates and rejected candidate list also Physical Test Date provided here. The institution of Public Service Commission, for the first time evolved under article 264,265 and 266 of the Government of India Act 1935. Article 188 of the 1956 Constitution and Article 186 of 1962 Constitution of Pakistan provided for the establishment of Public Service Commission. The Khyber Pukhtunkhwa Public Service Commission is established under article 242 of the 1973 Constitution and is functional under the Khyber Pakhtunkhwa PSC Ordinance 1978. The civil service of the province and civil posts in connection with affairs of the province in basic pay scales 16 and above or equivalent and Posts in basic pay scale 11 to 15 or equivalent specified in certain Departments of the Provincial Govt.